Lean back with your little one on this plush swivel glider recliner. Smooth rolled arms and T-styled cushions create a soft, transitional style, while premium cushioning fibers keep you and your youngin feeling cozy and supported. Available with contrast cording option. Manual or power rocker recline available. 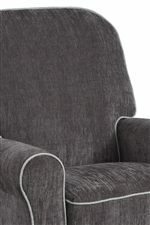 The Storytime Recliners Tryp Power Rocker Recliner with Rolled Arms by Best Chairs Storytime Series at Best Home Furnishings in the St. Louis, Chesterfield, St. Charles, MO & Waterloo, Belleville, Edwardsville, IL area. Product availability may vary. Contact us for the most current availability on this product. Fabric Content Over 700 different fabric and leather styles have been brought in from the top mills and tanneries all across the world. Fabric Options Fabrics tailored for children's rooms and nurseries. 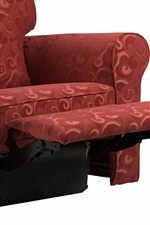 Recliner Mechanism "Gravity activated handle-assist" enables customer to adjust ease of operation. 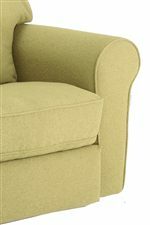 Padding & Ergonomics High-Density Foam/High-Loft Premium Polyester Cushioning. Plushest, most comfortable seat in the industry. 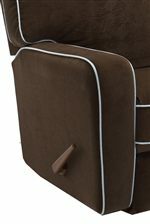 Chaise pads are attached with industrial-strength Velcro for adjustments and to looking new for life. Seat Support Sinuous wire springs are cross-wired to prevent sagging. Srping clips are coated with polypropylene to prevent squeaks. The Storytime Recliners collection is a great option if you are looking for Transitional furniture in the St. Louis, Chesterfield, St. Charles, MO & Waterloo, Belleville, Edwardsville, IL area. Browse other items in the Storytime Recliners collection from Best Home Furnishings in the St. Louis, Chesterfield, St. Charles, MO & Waterloo, Belleville, Edwardsville, IL area.